In January Titan Books published The Complete Aliens Omnibus Volume 1, bringing together the first three expanded universe Alien novels by Steve and Stephani Danelle Perry. We decided to review each book separately rather than do a shortened over-all review and we have just uploaded our last review! 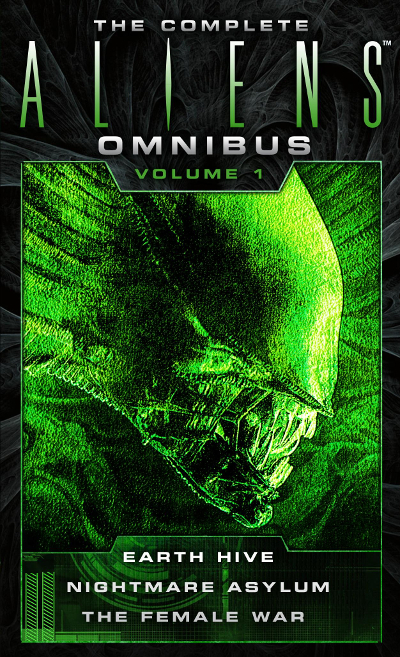 We have just uploaded our reviews of The Complete Aliens Omnibus Volume 1! Be sure to check out all three of our separate reviews – Aliens: Earth Hive, Aliens: Nightmare Asylum and Aliens: The Female War. The Complete Aliens Omnibus Volume 1 is a book that anyone who has interest in the expanded universe of Alien should get. The initial trilogy may not be perfect stories but I do believe they are essential reads in understanding the Aliens series as it is now. They haven't said anything, but with next year being the 30th anniversary of Predator, I would be surprised if they didn't reprint the old books. I hope so, more people need to read Predator: South China Sea. On that topic, has Titan said anything about reprinting the old Predator Bantam novels? None of the DH Press stuff has been republished. I'll be curious to see if they are included in these new omnibus. There are 3 more Omnibus Collections slated for 2017. I knew Aliens: Original Sins and Steel Egg have yet to be re-released. Anything else? Wilks and Billie simply have no style. It's poor second-hand fiction. But it just isn't though. It's the exact same characters with different names. If you're saying they're badly developed rubbish, then you're basically saying the development of Hicks and Newt in the EU stories was rubbish, because nothing else was altered about them beyond the names printed on the paper. The fact that it is so glaringly transparent that they are those other characters and we have to play pretend the whole time is insulting to the reader's intelligence. The stories cease to make sense when they are faced with a Ripley-Bot. The development of Hicks and Newt was good because it was based on the original Aliens film, but the story of Wilks and Billie is flawed because it asks the reader to accept that the exact same story as Aliens happened elsewhere and the only survivors were a little girl and a marine. It's a stretch, and It's trite. It's like saying that we are going to discover derelict juggernauts on all these planets now. It was innovative in Alien, but then we had it happen in Prometheus where the juggernaut became a derelict, and now we seem to be having it happen in the Life and Death series. We'll see how that one goes. Then there is also the River of Pain novel where yet again we see a marine with a little girl escape LV-426. Are we really doomed to keep repeating this story? Either continue the actual original tale with the characters who survived, or let it go I say. I think its wrong to think that shallow stories are an inherent product of the comic book medium, or any other medium for that matter. It really comes down the the skill of the artist and the writer. Traditionally speaking, yes you're right that comics have tended to be childish and unevolved, but that is always a conscious decision on the part of the creative team's decision to aim at a specific target audience. Have you ever read Watchmen, or perhaps Sandman? Therein lies a rich tapestry of comic book genius that would be disserved by transferring it to novel format. I was referring to the few Aliens comics I've read, specifically the early ones. They're nothing like as deep or involved as the novel adaptations, which aren't exactly Shakespeare as it is. I just bought and read female war the comic for the first time... and it was pretty terrible. I started the first few pages thinking this might not be so bad, but it is. Outbreak was good, nightmare was great, and female war is just not in the same league at all. It shouldn't be held against the comics as for the most part that's just the nature of the medium. I'm not holding it against the comics and saying they're rubbish. I'm just saying the shallower storytelling inherent with the format doesn't appeal to me personally. Nice art is all well and god but I need much more than pretty pictures to be fulfilled by a piece of fiction. And I find comics too rushed and devoid of depth in story terms. It would be great if they took these novels and retconned them so that Wilks and Billie become Hicks and Newt again. Only under such a circumstance would I buy a copy. But why? It wouldn't change anything about the content of the story. The fundamentals would all be exactly the same, just with different names sprinkled throughout. So what if Hicks is in it? All that does is introduce a bunch of background from a much better developed story. In regards to the whole Billie and Wilks thing, we've discussed this ad nauseam. I just think it is so tasteless to change the names of the characters. It is cheesy to think that these characters went through the exact same traumatic story and then also found a Ripley-bot to hang out with. Come on. It's childish and self-plagiarizing. Did Mark Verheiden even get credit in the novels? We both know this wasn't done for any artistic merit, but to accommodate Alien 3. Now that there is no need to do that, the comics and the novels should be restored to the original intent. Any other attempt to republish them is just a cash grab, devoid of their artistic merits. Not if you're writing a completely new story. If you're effectively writing a sequel there's nothing wrong with relying on existing development from previous entries. I'm not sure relying on character development from a previous story is really good story-writing practice though. I don't think the name change detracts from it. You have some background inherited with the names but Billie and Wilks' backstory is told and it's largely the same. The detractions come from where the retcon isn't so tight - old names spilling through, the lack of explanation for RipleyBot2000. I suppose it would have also inherited some emotional attachment to the characters straight off the bat too. It would be great if they took these novels and retconned them so that Wilks and Billie become Hicks and Newt again. Only under such a circumstance would I buy a copy. And I would pick up the omnibus for sure in that case.. Thank you. That's exactly my problem. This is the last thing I'll say about the subject. The problem I have with novelizations is that, movies/comics made into books is almost exactly the same as books made into movies, the adaptation is not as good as the source. Preach on Number 13. 100% agree. Then Alien3 killed off the three of them, so they reprinted the books with Newt as Billie and Hicks as Wilks, and Ripley was the same, don't ask why. Then when the Perrys did the novelizations, they made Ripley an android to explain how she was in the story. Wrong. As Hicks said, the novels came before the edited comics. The novels started coming out in 1993, the edited comics didn't appear until 1996. Presumably Ripley was never changed in the comic books because it would've involved a lot more work than just retyping some names. They would've had to create entirely new art and story sequences. Comics are a visual medium and its about the art and style more than story and narration. Of course novels are going to have deeper more fleshed out stories and characters, I'm sure that's the whole point of adapting the comics into novels in the first place. It shouldn't be held against the comics as for the most part that's just the nature of the medium. Oh wow! I really appreciate the offer but no worries on that my friend. I actually have Amazon open in another window & was just looking for it & when I saw the cover I knew right away. I knew I had it, I must just have it packed away somewhere as I find it odd that it's not with the others. I recently moved a month ago & packed up my stuff really fast like within a week type fast & still haven't unpacked everything. Thanks again for the offer though, that's a sentiment I rarely ever come across. I think I have a spare copy lying around if you need it. You should mate. With the omnibus coming out it'll be pretty easy to grab them at reasonable prices and in good nick. I will definitely look into it dude! And I was totally wrong on which novels I have. I thought I had Cold War but I don't. Turns out it was "Aliens vs Predator: Hunter's Planet" & then I also have "Aliens:Harvest" & "Aliens:No Exit". I could have sworn I had Cold War too. At least in Rogue I found it believable that Kleist's dedicated cadre would agree to help him. His insanity was much more slow-burning and directed largely at the innocent civilians who couldn't really do much to stop him. It's been a long time since I read the novelization. Considering the praise you often give it I might give this one a re-read soon. I actually wouldn't mind reading these adaptions! I've only read the comic versions of these stories. I've never come across the novels anywhere (in a store that is). I have the novel for Predator Cold War, that's the only comic/novel adaption I have which I haven't had time to sit down & read yet. I doubt we'll ever agree on Spears. I think the novel paints him as a much more interesting character with a genuine God complex. Well, I agree there was the potential for a really interesting character there. I just think they went way too far with the moustache-twirling evil and spoiled it. Stuff like feeding his own men to the Aliens without a second thoguht just because they make some minor infraction. It was too much. I found it completely unbelievable that his own guys wouldn't have turned on him en masse prior to Hicks kicking them into gear, because the guy was just unhinged. It didn't do anything to convince me anyone would put up with his psychosis. I liked the story in Nightmare Asylum, I just couldn't get passed how silly and over-the-top Spears was. I found him to be a daft caricature. I completely agree. I know you're not really a fan of Nightmare Asylum but I felt the same way about the book. I love the comic but I found the book to be infinitely better because of the expansions it made to the story. Regarding the novelization of the comics - I generally prefer them over the comics. I wouldn't say they muck things up or mess them around, rather it gives them the page space to tell a better story. Comics are quite limited when it comes to the story they can tell but the novelizations aren't and it makes for a better read in my opinion. This is why I much prefer the novels. Comics are almost always way too rushed for me, everything is rapid-fire like there's no room for anyone with an attention span. The novels slow things down and add some more substance to the bare bones of the story. The best things the novels do is expand upon the characterisation of the people involved. In the comics I've read, characterisation is often so heavy-handed and shallow that it comes across as naff cliché. I find it hard to know or care who anyone is because they have no meaningful personality. In the books you can actually get inside the characters and learn more about who they are and why they are the person they are. Case in point, I recently re-read Rogue and then got the comic, and the book is an infinitely more engaging and mature take on the story. Why don't they just write a novel based on the final product instead earlier drafts they didn't use? Just to build on HuDa's point, the novelizations are written alongside the film's production, often based on whatever draft they have at the time. Changes made to the film during filming or during editing aren't relayed to the novelizers. In my opinion the most interesting thing about novelizations are those differences between them. Because the book needs to come out around the same time as the film (in some cases, even before the film). It could take months to write, so the author needs to start early. I just don't like novelizations cause they make up stuff that the original writers didn't intend. They don't "make up stuff that the original writers didn't intend". They're based on earlier versions of the film script and as a result include things that were subsequently changed before/during filming. [Neither the book nor the film of AVP says that. It's kinda obvious considering that they're the same actor and it's the same company, Weyland Industries and Weyland-Yutani. Again, doesn't matter anymore. I just don't like novelizations cause they make up stuff that the original writers didn't intend. Like, doesn't the Alien novelization have an Alien with eyes, kills with his hands and no mouth-tongue? Or like, how the Predator novelization has Mac and Blain as both white and racists. Like, this is a horrible example but in AVP they were saying that Charles Bishop Weyland was the ancestor of the man that met Ripley at the end of Alien3. Neither the book nor the film of AVP says that. Well, I like the comic books the way they were before they changed them. I never really liked novelizations of anything, I feel they complicate things. They add material that mucks up things. Like, this is a horrible example but in AVP they were saying that Charles Bishop Weyland was the ancestor of the man that met Ripley at the end of Alien3. It makes perfect sense since we don't know anything about that man, he could've been the head of Wey-Yu. But the novelization of Alien3 said that he was just an android designer for Wey-Yu and not a Weyland. Again, horrible example, but doesn't matter now since AVP was retconned and I don't like Alien3. I don't think the retcons really did any harm to it. I think the interity of it starts to fall apart a little when Ripley shows up and only because the comics didn't address it at all (and they miss some of the old names. Ripley still refers to Billie as Newt at some point) and because the novelization never went into the how or why of the Ripley android. Otherwise, I think it worked fine. I've honestly never seen or read the reprinted versions so I had no idea about this Billie & Wilks change until recently. It's always been Newt, Hicks & Ripley to me & I think I'll keep it that way with my original prints. It's nice they're being reprinted (again) for those that haven't read them yet but I think I'm going to have to pass until something I DON'T have already in the comics gets reprinted. Well, in the original comic books it was Newt, Hicks, and eventually Ripley because they were published before Alien3. Then Alien3 killed off the three of them, so they reprinted the books with Newt as Billie and Hicks as Wilks, and Ripley was the same, don't ask why. Then when the Perrys did the novelizations, they made Ripley an android to explain how she was in the story. Course, I still don't think this ties with Resurrection, because 1st, they were written before Resurrection, and 2nd, in these books involve the Aliens taking over the Earth, in Resurrection it seems no one knew who the Aliens were. I think even after 200 years, I think people would remember the world becoming an Alien apocalypse. Ripley was an android in that series?? Wow now i understand what you guys meant about resurrection! Sorry again! I have nothing against Perrys, I just prefer the stories the way they were when they were first released in the comic books. The whole thing about changing Newt and Hicks' names was dumb and then making Ripley a robot just doesn't make sense. Which is why, I'm glad they're rereleasing the Mark Verhieden comic books the way they were when they were released. No more Billie and Wilks. Course, I already have the comic books, my half brother gave me Volume 1 and told me where to get the rest. They're one of my most prized possessions. Too bad they're not as valuable, you'd think reprinted comic books would be more rare. But, as they say on Pawn Stars, just because it's rare doesn't mean it's valuable. Trying to decide whether I wanna get rereleases and give the old ones back to my half brother, or just keep the ones I got. Love those books. Thanks, Mr Helpful. I'm not referring to the death of Hicks and Newt, I'm talking about the whole existence of any story taking place between Alien 3 and Alien Resurrection. Is that right? It's so long ago, I don't remember which came first at this point. Yeah, that's right. I wondered about the correct order of events a few years back and looked into it. I also looked it up again recently when I made the comments in my reviews. Original comics with Hicks and Newt > novelizations with Wilks and Billie > reprinted graphic novels with new titles and new character names. Alien 3 only wiped the idea of newt and hicks in the EU, which is why it was retconned. The rest of the EU could get along with Alien3 until Alien Res came along and said there hadn't been any aliens found in 200 years since alien3. I wish darkhorse hadn't been so keen on keeping the EU inline with the films. You would think after Alien3 came out that they would have realized that Fox had no interest in maintaining a canon EU with the franchise. They are adaptations of graphic novels of the same name. Now keep in mind that the graphic novels are derived from an earlier graphic novel version of the trilogy. Wrong way around. The novelizations are based on the original versions with Hicks and Newt. The Perrys did the retcons first. Then the newer versions of the graphic novels came out and used the novelization names. Just fixed the quotes. Cpl Hicks. Are these novels all part of the same story and continuity? Yeah they were based on the very first Hicks and Newt comics. To be fair, all the older Bantam novels and Dark Horse graphic novels were in the same continuity, there were just some contradictions and Resurrection wiping them all out. Does anyone know if these are available as eBooks, or were made for the sole purpose of being back in stores? There does appear to be Kindle versions of these now. I know, already picked one. I think they've been available since the 12th of March. I've avoided Female War for like 20 years or more lol. but I finally caved and ordered the comic version, because I have all the other "Library Edition" Graphic novels. Even as a kid when I was lucky enough to be in a comic book store down state, I would be trying to decide on an aliens graphic novel and I would always put Female war back on the shelf. The art is just so terrible I didn't want it even though I needed it to complete my set. Oh well its on the way now, soon i'll have to decide whether or not to read the novels. These novels are indeed part of one continuity. They are adaptations of graphic novels of the same name. Now keep in mind that the graphic novels are derived from an earlier graphic novel version of the trilogy. The key difference between the graphic novels, was that the original version was intended to be a continuation of the story of Hicks and Newt after the Aliens film. When Alien 3 came out, effectively negating the existence of Hicks and Newt post-Aliens, the names of these characters were changed to Wilks and Billie.